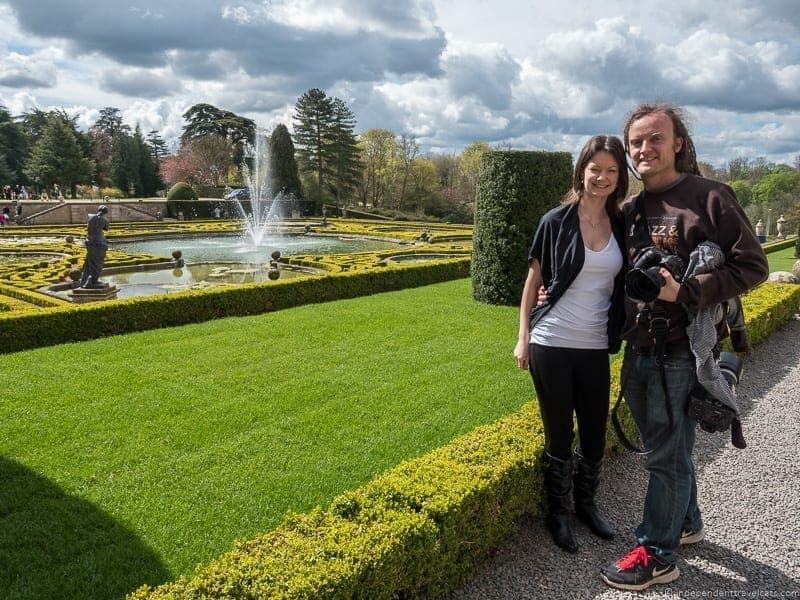 Recently Laurence and I did a London day trip to Blenheim Palace and the Cotswolds. London is a city that makes a great base for some really interesting day trips. Although we prefer to overnight in the places we visit, sometimes we are short on time and a day trip is a convenient way to see places that you would not otherwise have time to visit. 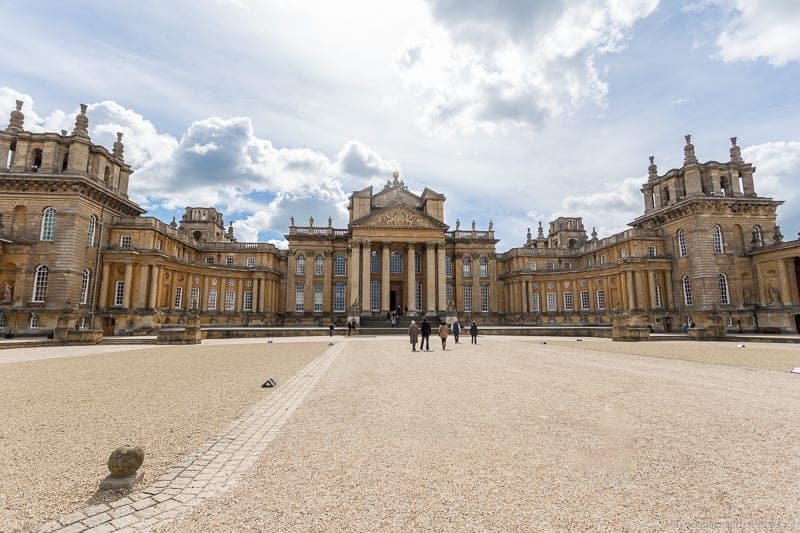 We were very excited to visit Blenheim Palace and a couple of the Cotswolds villages on our private tour by car with a Blue Badge local guide. On our London day trip, we toured the grand Blenheim Palace and the photogenic rural Cotswolds villages of Bibury and Burford. We’ll tell you how you can plan your own day trip from London to visit these places whether you want to visit by car, public transit, or guided tour. We’ll also share details about our own Blenheim Palace day trip along with photos from all the places we visited on our tour. There are several ways you could visit Blenheim Palace & the Cotswolds from London. These include by car, by public transit, by guided tour, or via a private transfer service or taxi. It is easy to get to Blenheim Palace using any transportation method. 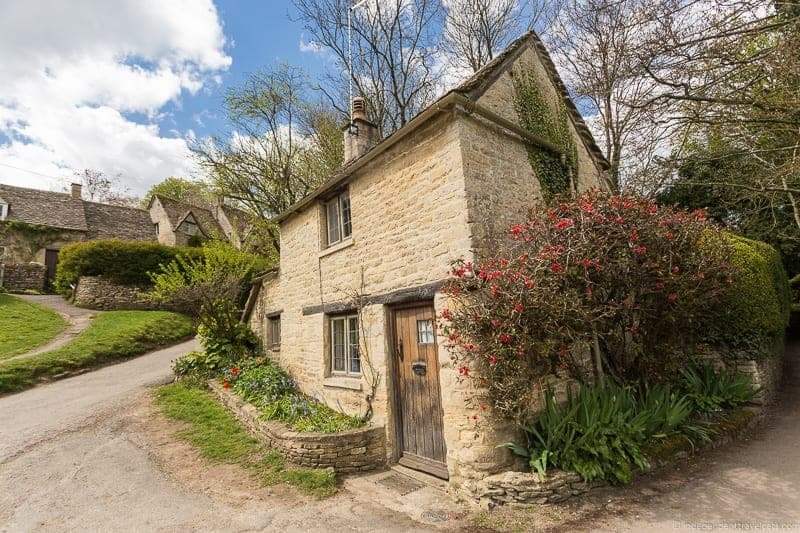 However, the Cotswolds are not as easy to navigate via public transit so visiting a few villages by car or via a guided tour is going to be the easiest. 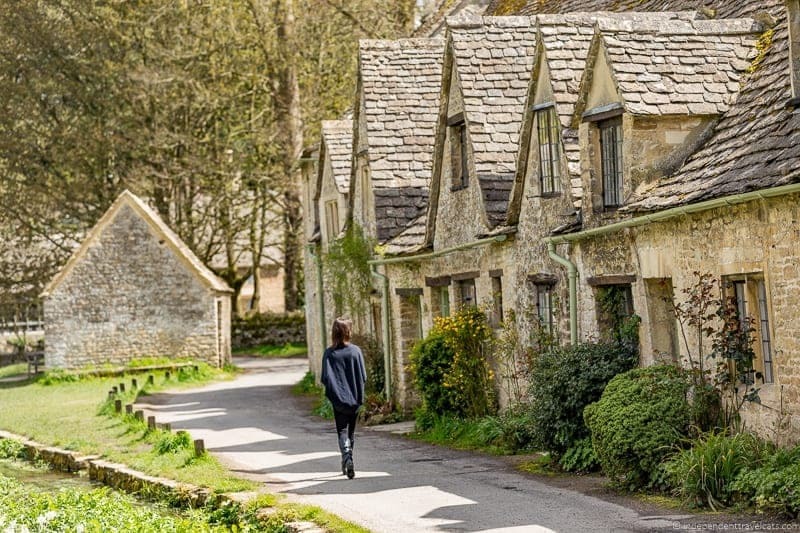 If you want to visit the Cotswolds via public transit, I’d recommend planning in advance (using the local bus schedules) and consider doing an overnight trip (rather than a day trip ) so you have enough time to see a few villages and aren’t so rushed. Blenheim Palace is located near the small town of Woodstock about 60 miles northwest of London and it takes about 1.5 hours (without any major traffic) to reach the palace. Free car parking is available on-site. Blenheim Palace sits right on the edge of the Cotswolds, so it is a short drive to reach the villages in the northeastern part of the Cotswolds but can take around 2 hours to reach the villages in the southern part of the Cotswolds. If you are driving to the Cotswolds directly from London, it is about a 2 hour drive to the central area of the Cotswolds area. The designated Cotswolds area consists of 504,000 acres so it is a huge area. So it is best if you figure out in advance which villages you want to visit. For example here are the approximate driving times from Blenheim Palace to different popular Cotswolds villages to give you an idea: Burford (27 minutes), Chipping Campden (42 minutes), Burton-on-the-Water (40 minutes), Bibury (37 minutes), Cirencester (50 minutes), and Castle Combe (1.5 hours). If you are planning to rent a car, you can check and compare rental car prices across companies on Priceline if interested in renting a car for the trip. We often find that Enterprise has the best car hire rates. Blenheim Palace can be reached by taking a train or bus to Oxford, then taking a bus to Blenheim Palace. 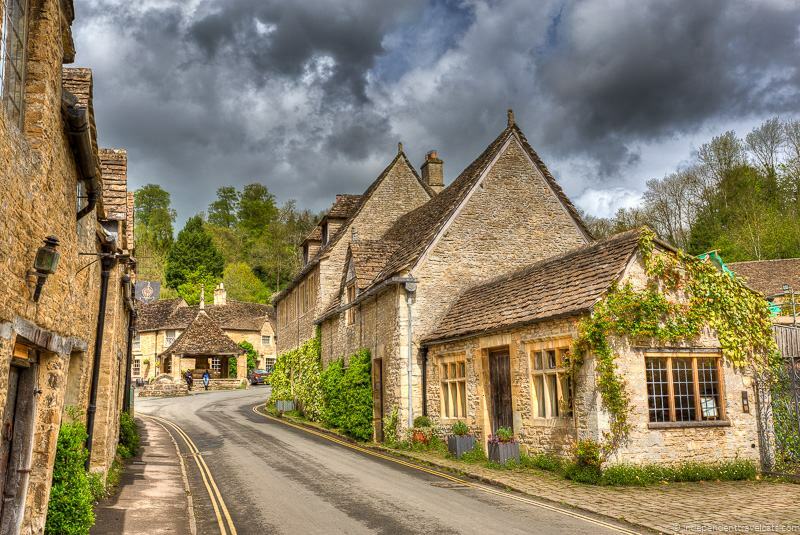 It is fairly easy to reach the Cotswolds by public transit from London, but you will then need to connect with local bus services or a taxi to get around. 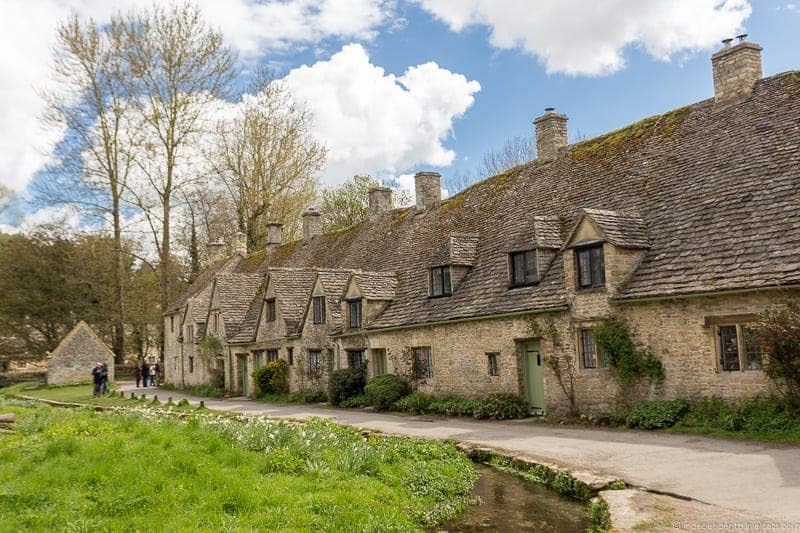 If you are planning to explore by public transit for a full day and visit a few different villages, you might want to consider a Cotswolds Discoverer Pass which covers many of the bus services and rail services from Oxford. To reach Blenheim Palace from London, you can take a bus to Oxford, and a bus ride takes about 1.5 hours. You can check prices at National Express as well as the Oxford Bus Company. Then once in Oxford, you can take a Stagecoach bus from the Oxford’s train station or bus station to reach the gates of Blenheim Palace, just get the S3 service to Woodstock. Or you can use the Oxford Bus Company’s Park & Ride 500 service to get to Blenheim (leaves from Oxford Parkway, take it to the Marlborough Arms stop in Woodstock). The Cotswolds is easy to reach by bus, but then you’ll have to figure out which local services will get you to the villages you want to visit. There are about 6 local bus services operating within the Cotswolds, serving different areas. This pamphlet can help you determine which of the bus services you’d need. Although it all depends on the villages you want to visit, Oxford and Cirencester (central Cotswolds town) both have a lot of bus connections and can make good starting points for a trip. You can then get local bus connections to get you to the village(s) you want to see. It is also convenient to get from London to Oxford by train and the journey takes about an hour, check National Rail for train schedules and prices. From the train station you can take the Stagecoach bus S3 mentioned above in the “By Bus” section to get to Blenheim Palace. If you need to get to the Cotswolds area via London by train, there are two main railway stations within the Cotswolds, one at Kemble (serves Cirencester) and one at Moreton-in-Marsh. You can catch local bus services or use a taxi to get around. Larger train stations are in the nearby towns of Oxford and Bath. Other nearby train stations include Banbury, Cam and Dursley, Cheltenham, Gloucester, and Stroud. It is about a 1.5 hour taxi ride or private transfer from London to Blenheim Palace. Then it will depend on where you want to go in the Cotswolds. You can compare taxi prices and make taxi and transfer bookings via minicabit. NOTE: While there are a lot of companies that offer taxi services between London and Blenheim Palace, you’ll find fewer options operating within the Cotswolds. I’d recommend booking a private tour (see section below) rather than trying to get around by taxi as it will be more convenient and save you money. If you book a private tour, you also have a guide (which you can use as much or as little you want). A guided day trip is a great way to visit Blenheim Palace and get a taste of the Cotswolds and see 2 to 3 villages. You can join a day trip in either London or from Oxford (if you want to take the train into Oxford first). Some also stop at other attractions as well. This tour includes Blenheim Palace, a few Cotswolds villages, and a 2-course pub lunch. 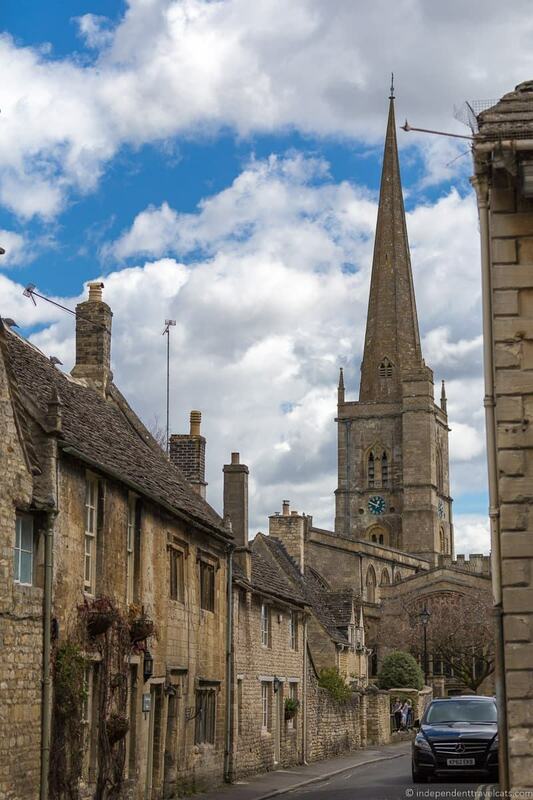 The guided tour includes a stop at Bampton (village used as a Downton Abbey filming location), 2 popular Cotswolds villages, and a visit to Blenheim Palace. 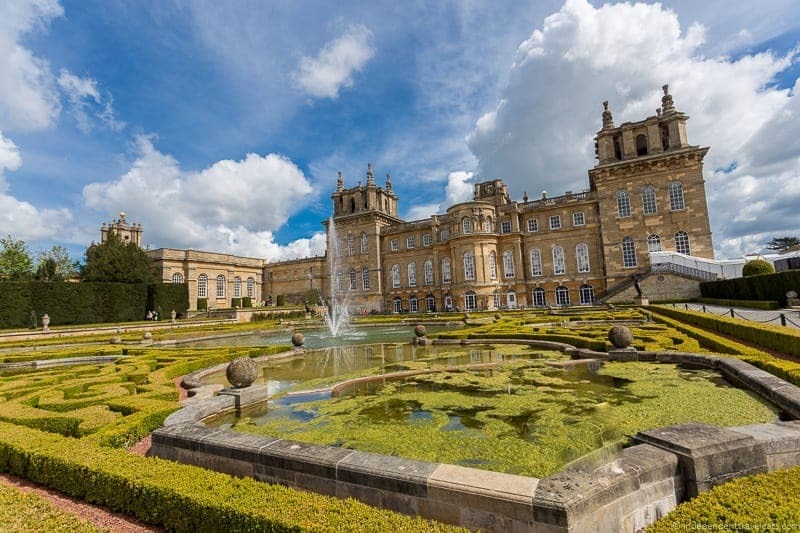 If you only want to see Blenheim Palace and be sure you have plenty of time there, consider this half day guided tour to Blenheim from London. If you are looking for a private tour that you can customize, we can recommend Robina Brown who is a Blue Badge guide who can customize the trip for you and she was the guide we used for our visit. 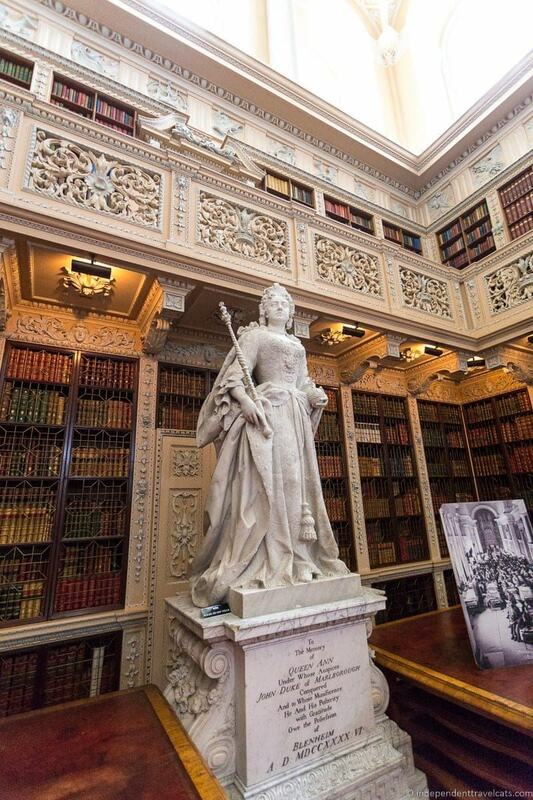 You can also check out this well-rated private tour from London. This tour includes stops in several Cotswolds villages, a 2-course pub lunch, and a visit to Blenheim Palace. This option includes stops at a few Downton Abbey Cotswolds filming locations, a stop at Winston Churchill’s grave, and a visit to Blenheim Palace. For a private tour from Oxford, we can again recommend Robina Brown or you can consider taking this private tour that can be customized. We actually booked our London day tour to Blenheim Palace by invitation from a company called Zestrip, an Italy-based online marketplace where local experts or guides could advertise and sell activities and tours to travelers. However this company has since closed. The private tour we took was with Blue Badge guide Robina Brown, and she still offers private tours throughout the UK via her website. Our tour was private and customizable, and our guide Robina was very responsive and easy to communicate with in putting together the details of our trip. We decided with her to visit Blenheim Palace, Bladon (where the Churchills are buried near Blenheim), and a couple of Cotswolds villages (Bibury and Burford). We could have easily fit another Cotwolds village or two into our day. Other nearby Cotswolds villages of interest that would have fit well with this trip are Bourton-on-the-Water, Upper Slaugther, Lower Slaughter, and/or Stow-on-the-Wold. Robina picked us up by car in London just outside the apartment in the Camden borough we were staying in with Homestay. Robina’s car was a roomy Toyota Previa mini-van that can accommodate 6 guests so Laurence and I had plenty of space to stretch out during our day trip from London. Our first stop on our trip was Blenheim Palace. It is about 1.5 hours without traffic from London, but we had some traffic leaving the city so it took us about 2 hours. Robina provided commentary during our drive and we had a very pleasant conversation which made the drive go by fairly quickly. 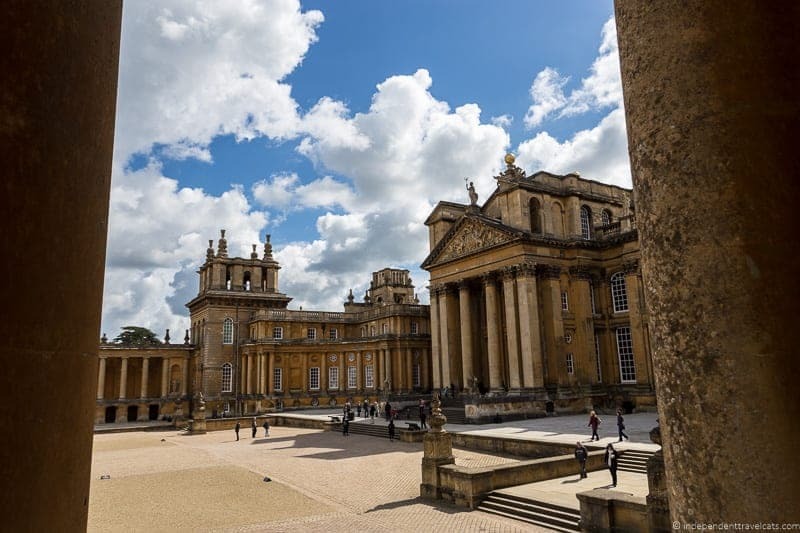 Although Laurence and I have visited Oxford several times (you can check out our recommended Oxford itinerary), we had never made it out to Blenheim Palace so we were excited to finally see it! Blenheim Palace is one of England’s largest country houses, and serves as the principal residence of the dukes of Marlborough. The Palace was built between 1705 and 1722 in the English Baroque style by Sir John Vanbrugh and Nicholas Hawksmoor (who also designed Castle Howard). Blenheim Palace was designated a UNESCO World Heritage Site in 1987. The palace is most famous today as being the birthplace of Winston Churchill, the home saved by American heiress Consuelo Vanderbilt, and for being a filming location for numerous TV shows and movies. Blenheim Palace is still a working estate and continues to be the principal residence for the dukes of Marlborough. It is currently the home of Charles James Spencer-Churchill, 12th Duke of Marlborough and his family. Robina explained to us that the current duke has had a bit of a checkered history and is considered a black sheep in his family, so it will be interesting to see how things move forward as he assumes the role of duke. We actually got a good glimpse of the Duchess and her two children who were walking out of the palace as we entered the main courtyard. 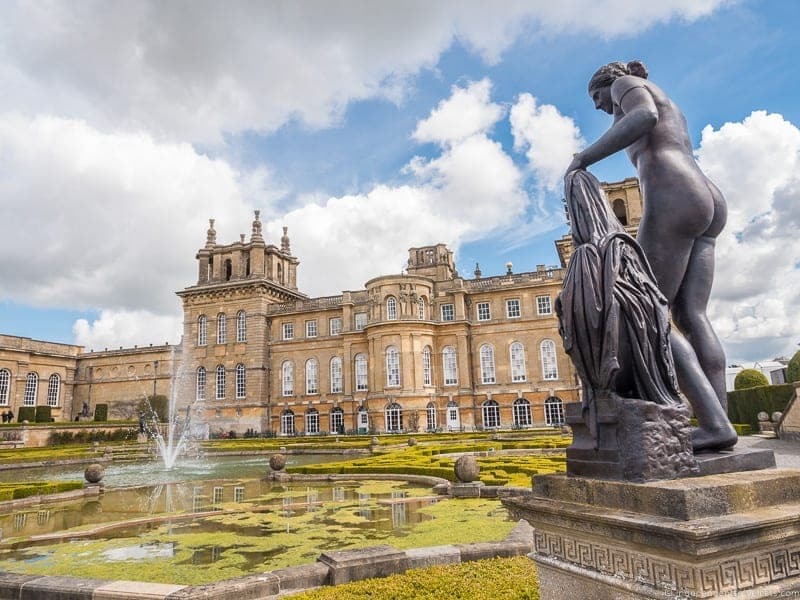 Blenheim Palace is definitely one of a handful of grand country homes in England that are on many visitors must-see lists when touring England, along with places like Chatsworth, Highclere Castle, and Castle Howard. 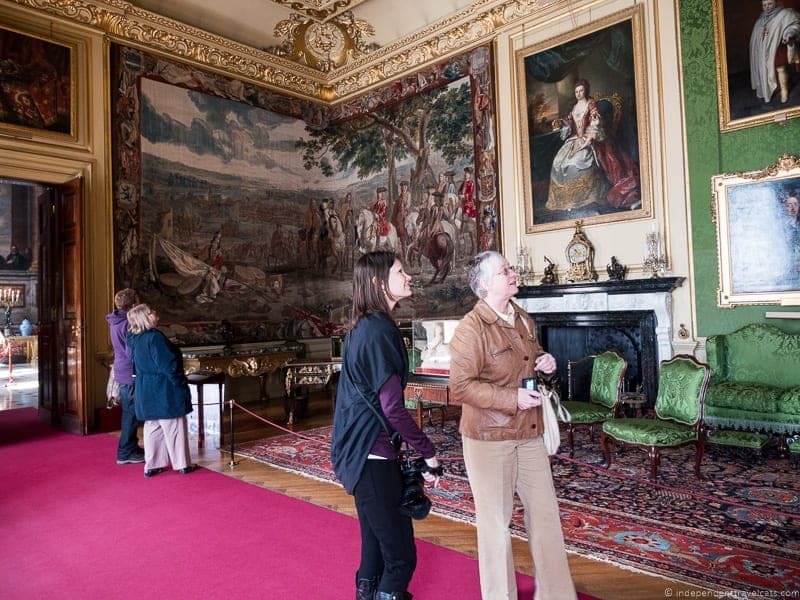 A tour here provides all the things that most visitors are looking for in an English country home—a grand house, sumptuous furnishings, insights into both the upstairs and downstairs workings of the house, a large hedge maze, and beautiful gardens and landscaping. The home is amazing in its size, condition, and decor and the stories about the Marlborough family and the servants are quite interesting. 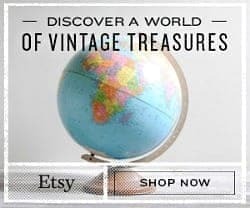 I was particularly interested in the strong American connection as Consuelo Vanderbilt was one of the original “dollar princesses”or “buccaneers” whose money and loveless marriage helped restore Blenheim Palace in the late 19th century and even Winston Churchill’s mother Jennie Jerome was an American-born socialite. Both Consuelo Vanderbilt and Jennie Jerome likely served as inspiration for Edith Wharton’s final novel The Buccaneers. Blenheim Palace is a particularly interesting visit for Winston Churchill admirers, as it was his birthplace and the place where he grew up and fell in love. There is a good Churchill Exhibition and video inside which tells a bit about Churchill’s life and connection to Blenheim. Blenheim Palace is a great place to visit in addition to the Churchill War Rooms in London. In addition to being the unintended place of his birth, Blenheim Palace was also the place he decided, after much encouragement by his cousin the 9th Duke of Marlborough, to ask Clementine Hozier to be his wife. 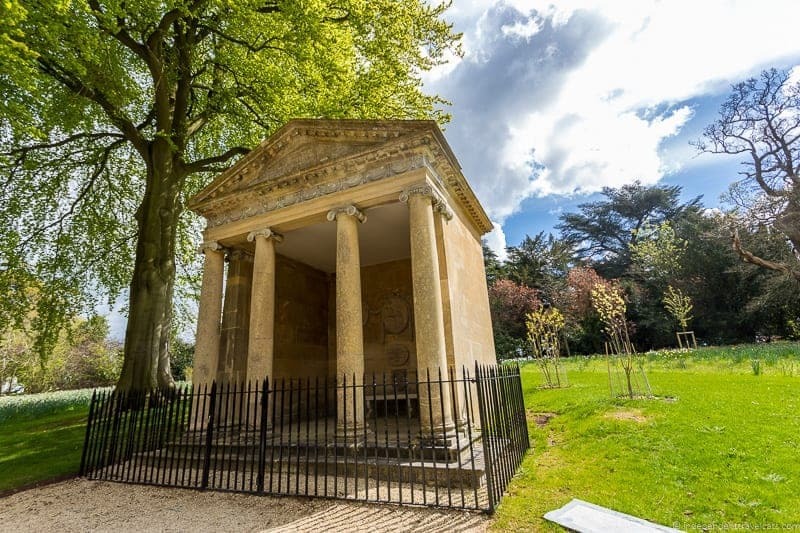 When exploring the gardens, don’t miss the Temple of Diana where Churchill proposed to Clementine and the Churchill Memorial Garden. If you are planning to visit Blenheim, you can easily spend most of a day here and at the very least I’d allow 2-3 hours for a visit. 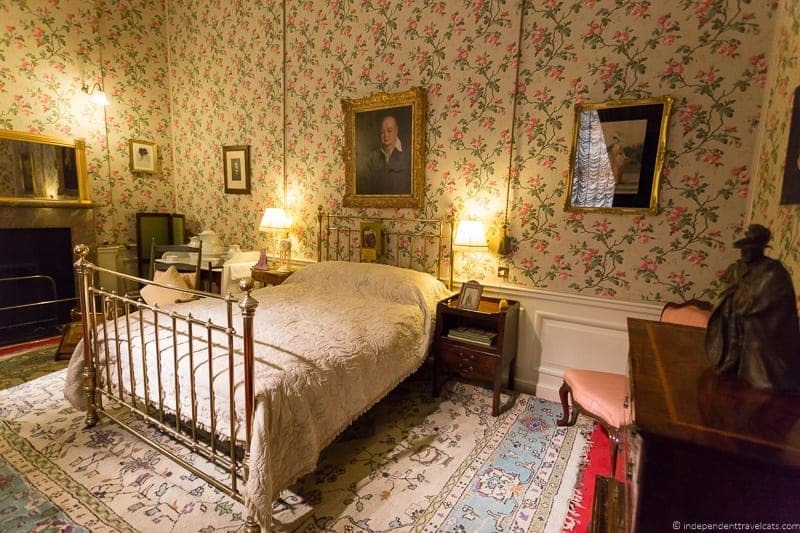 I would recommend at minimum taking a guided tour of the Palace State Rooms, visiting The Untold Story interactive exhibition, exploring the Churchill Exhibition, and taking a walk in at least one of the many gardens. All this is accessible with a main entrance ticket, and your ticket also comes with an optional audiogude. Current prices (as of August 2018) are £27 for the Palace and Gardens (most guided tours will include your admission tickets). You can book tickets directly via the Palace website here in advance, or buy them once you are at the Palace. You can currently save £1 per ticket if you book online via Viator here. If you have extra time, I’d consider spending more time exploring the gardens, a walk around the grounds, and taking an extra tour inside Blenheim Palace. Tours of the private apartments and Upstairs/Downstairs tours are space limited and timed so they require buying an extra ticket. 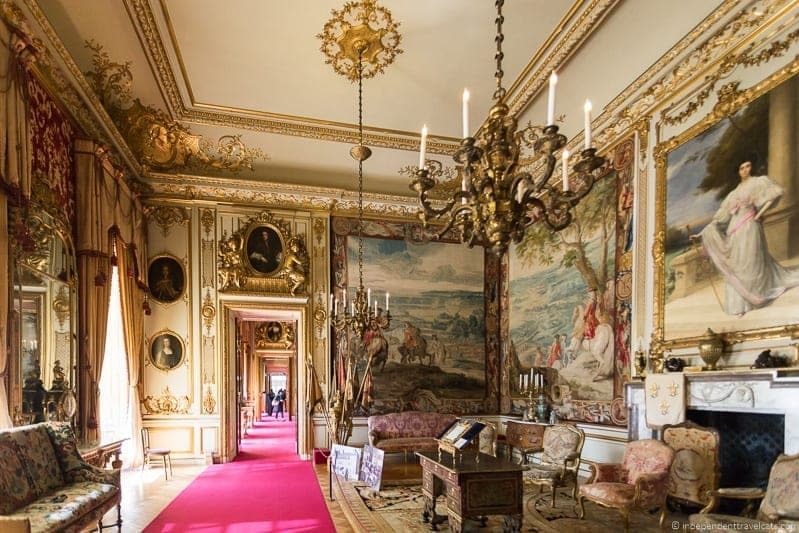 Each of the extra tours last about 40 to 50 minutes and cost around £5.00 per person; tickets can be purchased at the palace on arrival or booked online in advance. There are also several places to eat at Blenheim Palace, including a deli, a take-away counter, a cafeteria-style restaurant, and a more formal restaurant which includes the opportunity to indulge in a traditional afternoon tea. If you are flexible, I would try to visit on a day that forecasts decent weather to take full advantage of the beautiful landscaping and gardens; some of the park landscaping was designed by famed landscape architect Lancelot “Capability” Brown. Blenheim Palace is a popular attraction and can get busy. We recommend arriving early or later in the afternoon. We arrived to the palace just after opening time and it was not very crowded during our visit. BLENHEIM PALACE TRAVEL TIP: If there is any chance you’ll return to Blenheim Palace within the next 12 months, you can convert your tickets into a Blenheim Palace Annual Pass for free, just ask at the ticket counter. This can also allow travelers to split their visit over 2 days if needed. 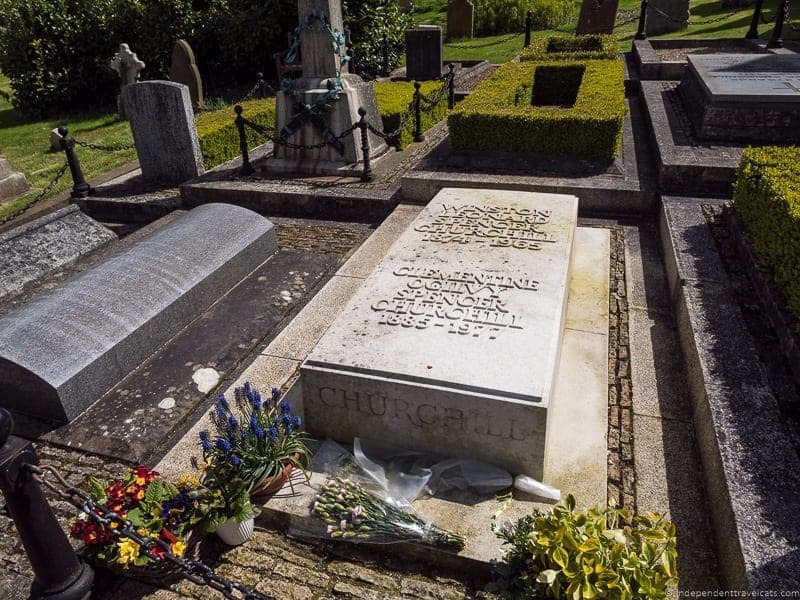 After visiting Blenheim Palace, we recommend taking a short drive to nearby St. Martin’s Church in the nearby village of Bladon to see the Spencer-Churchill family graves where Sir Winston Churchill, his wife Clementine, and several of his family members are buried. If the church is open, you can also see a small exhibition inside and a Churchill memorial window. This was a pleasant stop and we were the only people at the churchyard during our short visit there. But note there are only a few parking spaces next to the church so if coming by car, you may need to park in the village and walk a little bit. After our stop at St. Martin’s Church in Bladon, we headed to the Cotswolds. The Cotswolds is an area in south central England that contains parts of 6 different counties. The Cotswolds is a beautiful area and was designated as an Area of Outstanding Natural Beauty in 1966. It is characterized by rural villages, rolling hills, meadows, river tributaries of the Thames and Severn, and buildings made from golden-colored Cotswold stone (which is actually yellow oolitic Jurassic limestone). The main draw to the area is the scenic beauty and cute villages, but visitors also come with interests in hiking, birding, Roman history, gardens, archaeological sites, and historical buildings. 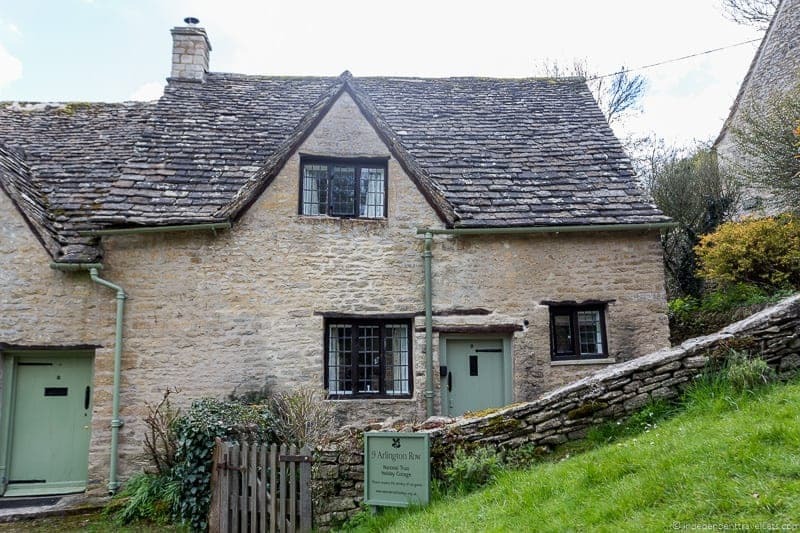 If you are planning to spend more time here I’d check out this tourism website and the conservation organization’s visitor website for the Cotswolds to learn more about the villages and various activities and events in this area. Our first stop was the village of Burford, which is known as the southern “Gateway to the Cotswolds”. Burford is a small town in west Oxfordshire that was ranked as sixth in Forbes list of most idyllic places to live in Europe in 2009. Robina gave us some information about the town and its main hotspots and then we strolled along High Street towards the River Windrush. Once a thriving small town full of merchants, farmers, and traders for centuries, Burford fell into steep decline as agricultural prices fell and it was bypassed by the railroad in the mid-nineteenth century. It is certainly an idyllic town to stroll, filled with historical buildings. Two of the town’s main attractions that you can visit are the Tolsey Museum housed in the 16th century Tolsey building and the St. John the Baptist church. The Anglican church was primarily built between the 12th to 15th centuries and is quite a magnificent church for such a little town! Robina shared some of the history and local legends of the town as we strolled around which made the little town come to life a bit more. 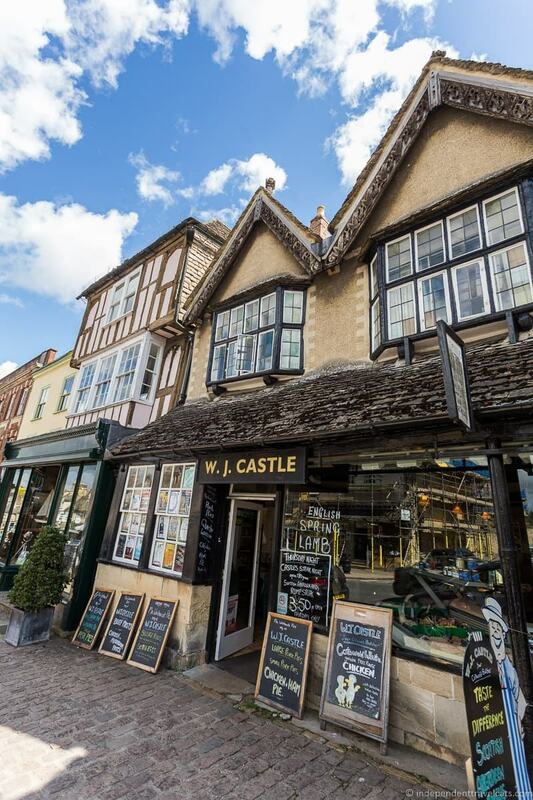 There are a number of historic buildings along High Street and its narrow sidestreets, as well as a number of places to shop and dine. We grabbed sandwiches and drinks for lunch at one of the small cafés here before heading onto Bibury, a short drive away. Bibury is a small Cotswolds village in Gloucestershire that was described by artist William Morris as “the most beautiful village in the Cotswolds”. 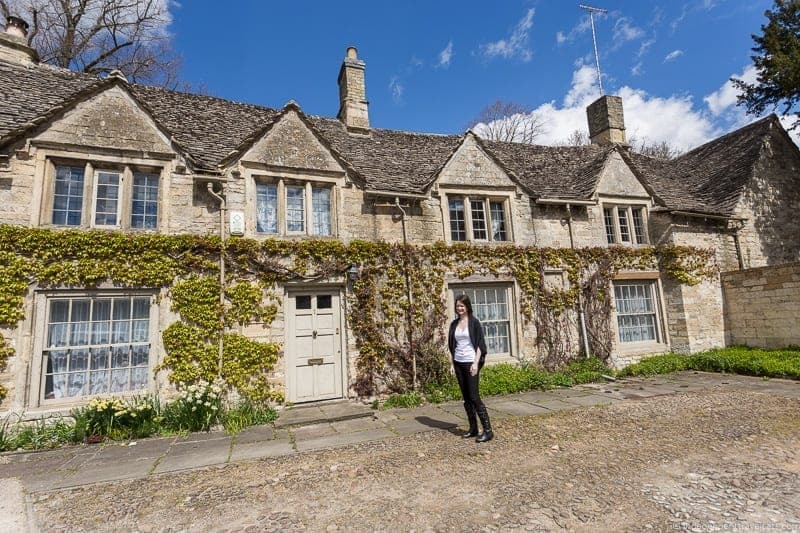 One of the most photographed views in Bibury is the picturesque Arlington Row stone cottages which were originally built in 1380 as a monastic wool store and later converted into weavers’ cottages in the seventeenth century. These cute honey-colored cottages are still lived in today by local residents (so do be respectful of the people who live here! ), and are some of the oldest inhabited properties in the UK. 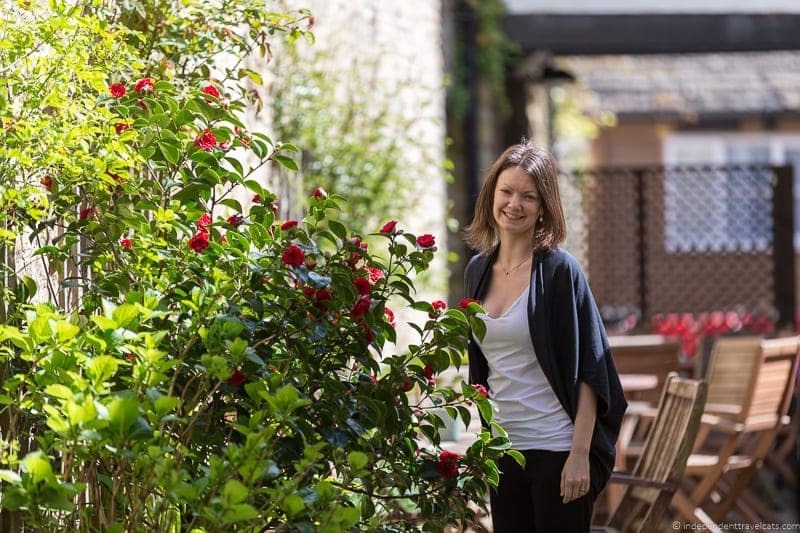 Arlington Row is owned and maintained by the National Trust and you can even book a stay at one of the weaver’s cottages that is rented out as a holiday apartment (9 Arlington Row) through the National Trust website. The weather was not the best on our day trip, but we had a brief period of lovely sunlight during our walk in Arlington Row and got some nice postcard-perfect shots here. The nearby boggy meadow next to the River Coln was known as Rack Isle. It was here that the weavers would hang the wool to be dried after being washed. The meadow seasonally floods and is often surrounded on three sides by water. But there are several other beautiful historical buildings in Bibury you should take the time to see as well. Other attractions in Bibury include the Bibury Trout Farm (a working fish farm for over 100 years), the 17th century Arlington Mill (once the mill cleaned and processed the area’s wool, currently a private residence), and the Church of St. Mary located in the village center which contains Saxon gravestones and Saxon architectural elements. The town is a popular tourist stop for visitors to the Cotswolds and is also often used as a backdrop for ads and films. The romantic fantasy film Stardust features a scene shot at Arlington Row, and in fact a British film was being shot in Bibury during our visit. 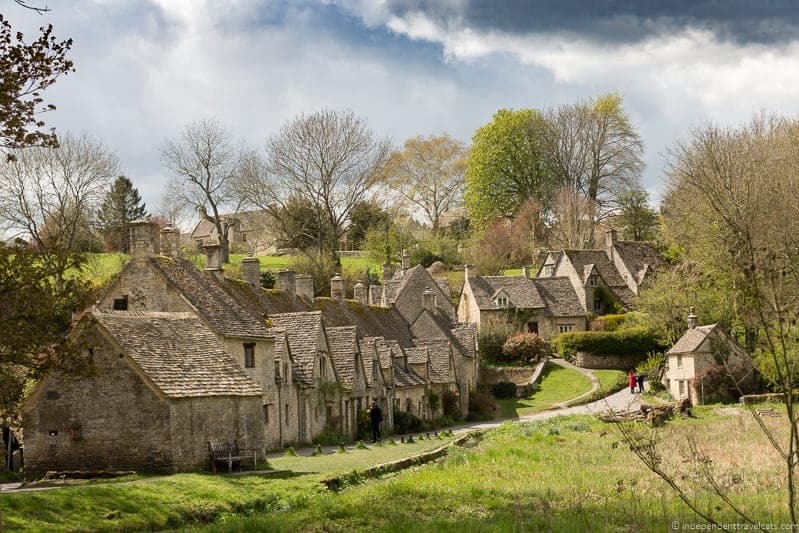 BIBURY TRAVEL TIP: Bibury is one of the more popular Cotswolds villages and like many similar small villages, it can become quite crowded. If you are looking for either a bit of peacefulness or the best photo opportunities, try to arrive early morning or early evening when most crowds have gone, or consider spending the night here. fancy spending the night here? First of all, we had a great full day out of London, visiting amazing places that included the monumental Blenheim Palace, Bladon, and two photogenic Cotswolds villages. We highly recommend all of these spots, whether you do a tour or go on your own as they are all very much well worth visiting. Robina was a fabulous guide and amazingly knowledgeable, friendly, and a good safe driver. We had a great experience doing this as a private day trip with her and she made the day easy for us. A guided tour is a great option if you don’t want to drive or take public transit. If you are planning a similar day trip on your own, we’d recommend stopping at Blenheim Palace first and then visiting some of the nearby Cotswolds villages. Villages we recommend considering are Burford, Bourton-on-the-Water, Bibury, Upper Slaugther, Lower Slaughter, and Stow-on-the-Wold. There are of course many others, but these one fit well with a day trip to Blenheim Palace. You could also easily plan to stop and visit Oxford on a day trip to Blenheim Palace, and you can read our guide to Oxford for ideas. There is plenty to do and see in Oxford. This area of Oxfordshire and the wider Cotswolds area is a beautiful area and there is plenty to do and see for several days. But if you only have one day, you can definitely get a taste of some of its highlights on a day trip from London. What is your favorite day trip from London? Have you been to Blenheim Palace or any of the Cotswolds villages? As always, feel free to comment and we’re happy to answer any questions about visiting Blenheim Palace, the Cotswolds, or anything else related to travel in the UK! These villages are amazing and your photos are fantastic as usual! Good timing – you have me plotting and scheming ways to get to the Cotswolds! Lately, the area has been getting a lot of attention, making us even more keen to visit. Hopefully soon! Great photos; we especially like those of Arlington Row! 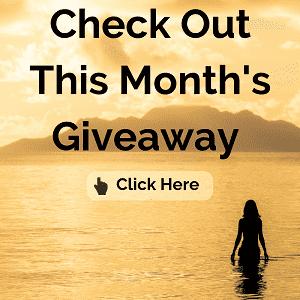 Thank you very much for this great blog post! As you say, we cover London and Barcelona.. but our main destination is Italy!! 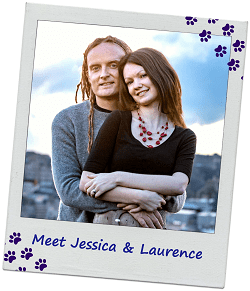 We’d also like to thank all Independent Travel Cats’ readers with a special 10% off list price. Drop us en email to get it! I had wanted to visit Blenheim palace during my year in London but never got around to it. Enjoyed the virtual tour of the place through your post. We’ve been in the Cotswolds, too. What an enchanting place, isn’t it? London was too busy for us, but anyway, a great experience! This seems like a great tour! I’d love to visit Cotswolds and the Blenheim Palace one day! Amazing photos! I’m sharing this on my twitter! These photos are really beautiful and make me feel excited about the places. It seems ZesTrip is a great place to connect with tour guides who can actually arrange tours in the local areas we visit. Jess, We just got back from London. We always love visiting it. We have yet to visit Blenheim yet it’s high on my list. We just can’t seem to get there. I love the photos…as usual. OMG I have always wanted to go to the Cotswolds and see Blenheim Palace! It’s definitely on the must-do itinerary the next time we make it to England to visit family! I will be saving this post! Sounds like the type of day trip I should take if I return to London. Are you always this lucky with the weather when you travel? You had gorgeous weather at Cotswolds and Blenheim Palace! You’ve made me want to go visit it too. The tour you did sounds amazing, I can’t believe how much you were able to see!. I really want to visit the Cotswolds. I’ve always wanted to visit the Cotswalds. they sound so very British and I picture myself sitting in some quaint cottage eating scones with clotted cream. 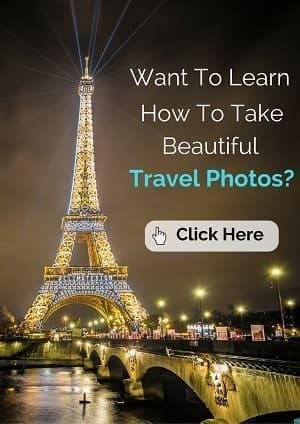 Your pictures are fantastic and make we want to visit even more. I wish I have known of this company before. I went to their website and took a looks at the offerings in Barcelona. There are a lot of walking tours, food tours and dinners at private residences. Feels like a great way to interact more with the locals. The places you visited from London are awesome. I am surprised all that fitted in a day. Now you have me very excited about my visit to the Cotswolds and Blenheim Palace next month. It looks so photogenic, and I can’t wait to walk around the villages and that grand house myself. ZesTrip sounds like the type of service that we’d use. Since we have 3 kids, going on a group tour usually doesn’t work very well since I’m so self-conscious about my kids disturbing the other people in the group. That’s why I much prefer a private guide. Last time I was in London was the first time I looked at day trips to do. Cotswolds was one of them I wanted to do, but got outvoted. Will do next time!